I am a total sticky beak when it comes to other people’s sewing spaces. If there is any opportunity to have a look at where other rad sewists perform fabric magic you can totally believe I am there for it. And given that El Husbando and I are on the hunt for a new house I thought I would take the opportunity to record my current sewing space. I am super lucky to have my very own sewing room and it was a couple of years in the making. Prior to this space I was using the good ole’ dining table for my sewing wizardry but the constant set up and pack down was becoming a pain. After a big clean out of of stuff and reorganise of our house I totally stuck a flag in this room. It overlooks our backyard and gets lovely morning light. When I first moved in the walls were purple and grey thanks to the previous homeowners. The walls were repainted a warm white (6 coats of paint!) and the ceiling was also freshened up as well. With a deep clean of the carpet it was like a new room. The furniture is all from IKEA and I spent ages planning (and saving) for what I wanted. There are two tables for cutting down one side, one larger table with a filing cabinet for sewing on and two Billy bookcases for pattern, fabric and book storage. Patterns are organised into A4 sized boxes (Dresses, Separates, Random Goodness, Tracings) which keeps a lid on my collection size and things neat and tidy. Notions and miscellaneous goodness as stored in CD boxes and my small sewing book collection is kept together. My fabric stash is finally well under control and is even smaller than when this photo was taken. This is simply because too many pieces of fabric gave me sewing paralysis and I would also feel guilt about adding to my stash when I had other goodness I hadn’t sewn up. 20 pieces of fabric (not including lining) feels manageable and is working for me currently. And yes, I know I am a weirdo! My sewing crew at home is all Janome. My starter machine, Violet, is an ancient Janome and is currently off for repair. My current machine, Daisy, is a Janome MS5072LE and she is a mechanical workhorse. Marigold, my 90s Janome 543D overlocker, was a gift from my aunt and she works like a champ. My most recent purchase is a Janome 2000CPX is still in need of a name and finishes knits like a dream! Name suggestions are well and truly welcome!!! Finally, to make my lady lair complete I have my knitting and boxes of comics stashed under the cutting tables. My journalling supplies are spread over one table and can easily be packed up when extra room is needed. 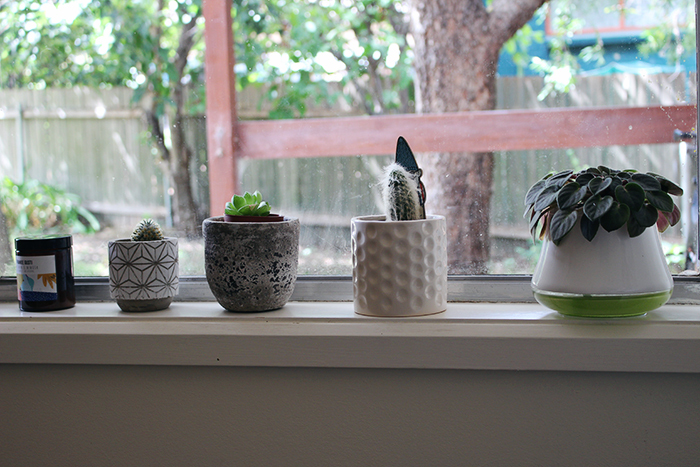 The one thing missing from these photos are my awesome project baskets. These are simply mesh baskets I use to manage my projects and place everything needed in them – fabric, pattern, notions, M&Ms. For this uber-neat freak they have been awesome at getting my sewjo kicking. So, there you go. My sewing room. It’s a total decadence to have and I totally love it. As we’re looking for a new house one of the criterion is a fab sewing space. I can’t wait to see where I end up next! Best of luck with your fabulous new drawer set up – they sound amazing! I love the idea of a TNT centre! I love seeing people’s sewing spaces too!! Your room is so neat and well organized! I’m a fabric and pattern junkie so that’s all downstairs and my small sewing room is upstairs. You have the elusive double space?! I am totally jealous!!! Mwah ha ha! The knitting bin I bought at Spotlight ready made but it does have a Wonderland vibe 😀 It holds so much yarn, too! I love your sewing room! It’s so well thought out. My biggest problem is how to store my interfacing without creasing it. Sometimes those creases don’t want to come out! How do you store your interfacing? My son built me cupboards ( as I was sick of all the boxes around and the fabric I wanted was always in the bottom box ) 30 drawers and 33 shelves . Oh wow! That sounds like quite the impressive space!!! And those cupboards sound amazing! Thanks for the look at your sewing room. It is very organized! Also I think a person should have as much fabric as they are comfortable with…not everyone is comfortable being surrounded by walls of fabric! *LOL* I hope you get an amazing sewing room in your new house! Thanks for sharing! I also love a sticky beak, being a total nosy parker. Your stash is admirable. I would like to sew down some of my stash because it’s honestly just a bit ridiculous – I think probably still smaller than some people’s but it’s too much for the way I sew, which is what matters. Having a separate sewing room is such a luxury, I’m always so grateful to have one, but it just makes such a difference. Fingers crossed the next one is even better! Also I meant to say, I’ve been doing the project baskets for about a year BUT I am obviously doing it backwards because I just collect everything once the project is begun. What this means is that I currently have three baskets with half finished projects in them that I am not excited about (they are all either fixes or things I’m sewing for someone else, not high motivation things) and then they get tucked away and I have to start a new basket… obviously I need better discipline! And how great are Janome overlockers? I know there are fancier ones out there but I wouldn’t trade my ole gal for the world! 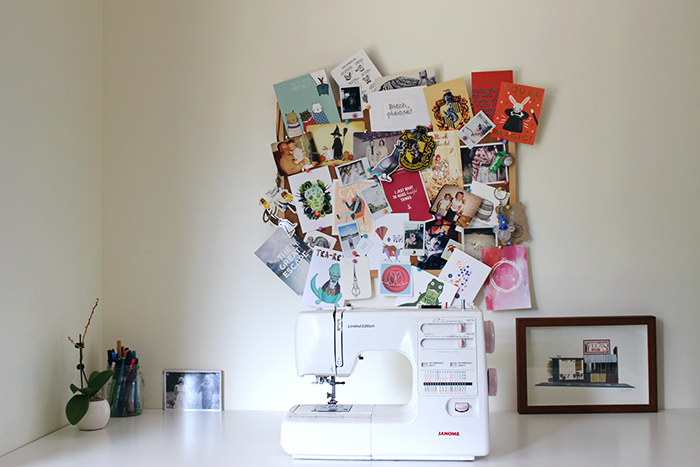 Your sewing room is beautiful, I love how neat and organised everything is. How do you find the Janome coverstitch? I’ve wanted one for so long but just haven’t been able to commit – it’s a lot of money and I’ve read so many differing reviews. I really dig my overstitch especially for hems – those stitches just don’t break! If you do a lot of knits than it is a great investment but it is a total luxury! You are far too tidy! (I think that’s just jealousy because my room is tidy for all of maybe a day!) I need to stop buying fabric, I too have sewing paralysis, but when Istop by the shop for a zip the awesome fabric just jumps into my arms! Ohhh Rose is a great suggestion! I too understand the fabric that jumps! A lady has to snaffle those goodies up 😀 I’m just lucky that I don’t have a LFS within 20 minutes of me!! I am so stoked we’re looking for a new place! We’re tossing up between getting a place that is good to go or one that needs some reno work… Gah! Adulting is hard, yo! You are so organised. I am fortunate enough to have a large sewing room for my machines but my fabric is now spreading everywhere. I am a big fan of really useful boxes. Had the Janome cover stitch for a year now and does an amazing job. How good are handy baskets and boxes? Total sewing game changers!!! I think Betony would suit your new Janome 2000cpx.